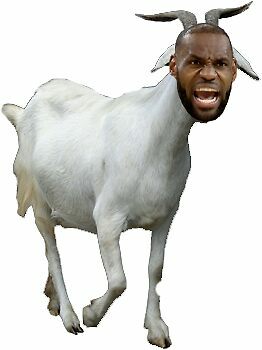 Discuss anything related to perhaps the most controversial debate in NBA history as to who's the G.O.A.T. Give your takes with reasoning/evidence, maybe you can change a few minds along the way. Current vote stands at 3:1 LeBron's way, make sure to get your votes in ASAP! WHY JORDAN IS NOT THE GOAT OF THE NBA! 1. JORDAN PLAYED IN AN EXPANSION ERA. Firstly, Jordan played and mostly won championships during an expansion era of the league. Yes, believe it or not, Michael Jordan played during an era where the league was still trying to find its own identity and incorporate different cities of America into the league. Because of this, Jordan played against some of the worst competition the league has ever seen, owning some of the worst records in NBA history that still stand today. During his career, 6 sub .500 teams were added to the league, which in turn, diluted an already inferior talent pool within the early stages of the league development. As we’ve already established, the league was still discovering itself and developing during MJ’s career, and as a part of that development, league rules were also a central part of that change. Now, I know what some of you are thinking, but before you start yell “hand checking, hand checking”, keep in mind, Jordan played during a time where the illegal defense rule existed. This is massive because hand checking is really nothing in comparison. The magnitude of the rule doesn’t compare to the significance of the illegal defense. Without the ability to play a zone defense or anything close to it, defensive schemes were less elaborate and teams were unable to send or even show multiple bodies at stars. Can you imagine a league nowadays in which superstars were left with single man coverages? That was the reality. Can you imagine players like Kobe Bryant, LeBron James, Carmelo Anthony, Kevin Durant etc being able to basically go one-on-one with a defender who has been left there on an island with no hope in stopping them? It’s crazy when you think about that now in that light. Can you imagine some of the numbers the more modern superstars could have put up with that luxury. Since the rule was implemented, players such as Kobe Bryant, Tracy McGrady and Carmelo Anthony have all stated if they had to change one rule in the NBA, it would be eliminating the zone defense, which would enable them to be able to fully showcase their offensive talent one-on-one with a defender. MJ had that particular luxury that other scorers didn’t. Another notable rule change is the “best of 5” instead of the “best of 7” playoff series we are accustomed to today. Furthermore, other rule changes include the three-point line being a whole foot closer to the basket for a duration of time. As Jordan was being defeated and beat up by the Bad Boy Pistons, the league looked at and started to implement the punishment for over physical fouls and plays in general, which aided Jordan’s game. This is why when asked about Jordan, Wilt Chamberlin once said “Just remember (Michael), when you played, they changed the rules to make it easier for you to dominate…when I played, they changed the rules to make it harder for me”. You’d think that if the assumption Jordan played in a better era the numbers would back that up, right? Well they in fact do the opposite. Major stats taken across the board for the duration of his career indicate that Jordan did in fact play in an inferior era to today’s game. The overall Points Per game average was higher despite the fast-paced, more possessions per game we experience today. The Field Goals Made per game was higher, Field Goals attempted across the board were higher on average again despite the supreme pace we see night in and night out nowadays. The overall Field Goal Percentage was also higher. All in all, saving you some reading time, advanced stats are also not favorable. Not to mention basically everything that has to do with outside shooting, the three-point line and overall efficiency being better today. This is obvious, but simply put – individual and overall defense were less advanced when Jordan played. I often hear people claiming Jordan “would average 50 in this era”, but let’s be real, he wouldn’t average 50 (no one could do that), and even if he did average a high points per game average, it would be down to the increased pace and more possessions, not because the defenses or defensive players are worse now, because they’re not. Defensive schemes were extremely simplistic compared to the modern NBA era, and as we’ve established, the rules during this period were a major factor. Defensive knowledge and implementation was significantly worse, with teams not really taking away what other teams or stars liked to do on any given night. Double-teaming, triple-teaming and trapping were non-existent, play calls were less elaborate, timeouts were used less effectively, and the entire tactical side of the game was worlds away from what it is now. The game was definitely more physical but being more physical does in no way shape or form mean the defense was better, because it wasn’t. It’s no secret Jordan destroyed the competition, but it’s very interesting when they praise Jordan for dominating, but discredit today’s competition in comparison. It’s interesting because what people fail to realise is that Jordan played in the 90s version of the Golden State Warriors that we see tear apart the league today. Jordan’s Bulls were absolutely the equivalent in their era. Of course both teams were built and constructed differently, but their dominance and status were the same. Jordan played under the arguably the greatest coach we’ve ever seen in Phil Jackson, with one of the best two way players we’ve ever seen in Scottie Pippen who was an MVP caliber talent, a supreme bunch of role players who were specialist shooters in a time where there were much less than now in Steve Kerr, BJ Armstrong, Toni Kukoc, Craig Hodges and John Paxson, and the greatest rebounder and maybe defender ever in Dennis Rodman. This isn’t to mention other great pieces but you get the point – the overall competition was less and Jordan played in arguably the most dominant team the league has ever seen. Unlike other superstars, Jordan never faced a team in the playoffs or NBA Finals that had a better team or head coach than he did. We’ve already spoken about competition, and the lack thereof, but let’s go a little deeper with this. We live in the golden age of guards nowadays in the NBA, and when you really think about it, not only was the guard position not as strong during MJ’s career, the lack of competition and talent was awful in comparison. When Jordan retired, the Bulls won only two less games the next season, Scottie Pippen was arguably the MVP and the Bulls were a play or call away from going to another NBA Finals, all WITHOUT Jordan. This speaks volumes on both the lack of overall competition, and further evidence of how good and well-coached those Bulls teams were. If competition was as high as people perceive it was, it wouldn’t be possible to lose the best player in the game and remain nearly identical through the regular season as well as knocking on the door for another NBA Finals. Jordan’s direct competition was also poor. If you think about the players that actually had to check him one-on-one, besides a couple of exceptions the resistance was minimal and laughable in hindsight. I mean, players like Jeff Hornacek and Reggie Miller, really? One of Jordan’s most famous shots ever was over the Cavaliers’ Craig Elho. Elho himself said that moment made him more famous than anything he ever did on the floor and it’s true. Jordan went against Karl Malone and John Stockton in their later years yes, but neither of them were directly checking him, nor can anyone realistically name another person off the top of their head on that roster that was worth mentioning alongside Stockton and Malone. Jordan even went against Gary Payton (who is listed at 6”4’ but isn’t close to that), and Payton actually played him the best out of anyone before getting hurt. I’m not saying Jordan played against no one, but the overall competition is definitely diluted and misjudged for that period of time. People forget that arguably the two greatest ever defenders actually played alongside Jordan instead of guarding him. He never had to put buckets on Dennis Rodman or Scottie Pippen when it matters most or when a ring was on the line, they were right there next to him in the same jersey. Furthermore, people claim the East is bad nowadays but have quickly forgotten how bad it was at times in those days as well. The 85/86 Bulls went 30-52 and made the playoffs, the 90-91 New York Knicks went 39-43 and made the playoffs, but the 15/16 Bulls go 40-42 missing out on the playoffs, just one of many comparisons that can be made during that time. We haven’t even discussed the continued globalization of the league which increased the talent pool and competition across the world over time, especially with the European players. Or even dived into the ability and opportunity of generations to learn off the past and better the present. All in all it’s actually systematically and fundamentally impossible for any professional sport to get worse over time. That’s not opinion that’s just science and the evolution of the game and professional sports in general. I believe it’s hard for the older generation of basketball “greats” to accept and understand, and it’s a reason why they’re quick to discredit and judge the modern NBA player, but it is what it is. Michael Jordan is absolutely a basketball icon and will forever remain that way, but there are some myths that are alive and thought of as undeniable fact which shouldn’t be the case. This is one of them. The truth is, Michael Jordan played in a less advanced and developed time in basketball, and it’s ok to acknowledge it.